As the curtains are drawn on the 2018/19 season, the 12 Bundesliga teams that will contest the 2019/20 edition of the competition have begun their preparations for the new campaign. With the fixtures for the new season released in a matter of days, bundesliga.at takes a look back at the 2018-19 Bundesliga campaign; the winners, the losers and those who will hope to enjoy European success next season. In possibly the most competitive title race in the Bundesliga for some time now, defending Champions Red Bull Salzburg did go on to retain their title and win the Crown for the sixth successive season. Despite an opening day defeat to Rapid Wien, Salzburg went on to record a ten match unbeaten run between August and November which saw them establish themselves as title challengers. Austria Wien and Sturm Graz had started the season extremely well and were establishing themselves as title contenders. By the end of November, Austria Wien were top of the table by a solitary point from Sturm Graz, with Salzburg being sat 8 points behind leaders Austria after 15 games. Wacker Innsbruck who had only won promotion from the Erste Liga the season before, were sat in third, just six points behind Austria Wien, hoping that they could continue their fine form and make their own run for the league title. Salzburg though were showing that they would continue to be a presence in the bid for the title, and, after a 2-1 defeat to Wacker Innsbruck at the beginning of November, went on another unbeaten run of 11 games to really bring themselves into the title equation. They beat Austria Wien 2-1 at the Generali Arena and Sturm Graz at the Merkur Arena meaning that by the time Matchday 22 was over and the initial stages of the campaign were finalised, Salzburg sat two points clear at the top of the Bundesliga table. Austria Wien were second on 46 points, Sturm Graz third on 42, whilst Wacker Innsbruck had slipped to fifth as Rapid Wien had recovered from their own shaky start to bring themselves firmly back into European contention. Meanwhile with the league being split into the Champions Play Off and the Relegation Play Off, it was St. Polten who propped up the top half of the table, leapfrogging LASK Linz on Matchday 22. Heading into the final ten games of the season, Salzburg went on to win five of their ten games to ensure they won the Bundesliga title by 6 points clear. Austria Wien, who had stuttered and endured a terrible run of form of 8 Bundesliga games without a win between March and April, managed to win four of their remaining five games and ensure a second placed finish and a Champions League berth. Meanwhile Sturm Graz and Rapid Wien, who had benefited from the 50% points reduction at the beginning of the Champions Play Off, were unable to launch full attacks on the title race and finished the season in third and fourth, with Sturm Graz qualifying for the Group Stages of the Europa League and Rapid Wien entering the competition in the Third Qualifying Round. Wacker Innsbruck finished fifth with St. Polten in sixth, meaning both sides moved into the European Play Off with the side that finished top of the Relegation Play Off but more on that later. Meanwhile, at the other end of the table, Admira Wacker couldn’t have wished for a worse start to their league campaign. Having qualified for the Europa League in the season before, they had European distractions but by the time September rolled into October they sat bottom of the table, having picked up only three points from three draws. They had suffered six defeats from their first nine games and were staring relegation in the face. Just two points above them though were Rheindorf Altach who had only five points, although having beaten Wolfsberger on the opening day of the season they had a solitary victory to their name. LASK Linz had started the season steadily and had acquired 13 points after nine games, but there were just two points separating Mattersburg in 7th and St. Polten in 10th. Sitting in 8th and 9th were Wolfsberger and Hartberg respectively with all the sides worried that it could be a long season in the battle to stave off relegation. However by the time November rolled around and 15 games had been played, Admira Wacker had revived their form enough to have picked up three wins and move away from the relegation places, with Wolfsberger and Hartberg sliding down the table with the latter now occupying the final relegation places. Mattersburg had closed the gap on 6th placed LASK Linz to just two points with Linz starting to fade away after a positive start to the season where they had looked to be challenging for Europe. LASK’s stuttering form ended up costing them come March and Matchday 22 as they slipped in to 7th position, however they were still 13 points clear of bottom placed Hartberg. Wolfsberger were left looking over their shoulders with ten games left as were Admira Wacker, although their three point lead over Hartberg gave them slightly more breathing space. LASK continued to struggle heading into the relegation play off after the league was split in two, and as a result of their poor form they moved down to eight, with Rheindorf Altach shooting up the table with some fine form in the final ten games, to seal a place in the European Play Off against Wacker Innsbruck and St. Polten. Admira Wacker did just enough to seal their place in next season’s Bundesliga, finishing four points clear of the relegation place. But for Mattersburg and Wolfsberger it was a huge sigh of belief as they avoided the drop on goal difference, with Hartberg facing the drop and the prospect of a season in the Erste Liga next season. Having managed to finish 7th in the Relegation Play Off table, Rheindorf Altach secured their chance, the final chance to clinch European football, where they came up against Wacker Innsbruck and St. Polten. Rheindorf Altach went on to meet St. Polten in the semi final, securing a 3-2 victory over the side who finished sixth in the Champions Play Off. Then after a few days rest, Rheindorf Altach faced off with Wacker Innsbruck, winning 1-0 in the final, to seal what will likely be a memorable European campaign next season. After a long and arduous Erste Liga campaign, it was Floridsdorfer who secured their place in the 2019/20 Bundesliga beating WSG Wattens to the Erste Liga title by a solitary point. It will be Floridsdorfer’s first campaign in the top flight for over 50 years, and they will be desperate to make an impact in the league next season. ScottT: A fantastic season indeed, it could have been better for sure but like Steegmann has said it was a huge learning curve and one we will definitely learn from and hopefully make amends for next season. The games in Europe will be entertaining for sure but I know we’re capable of getting through them and reaching the promised lands of the Champions League. Jack: Just a European regular would be an incredible achievement, not only because it would give us a lot more cash and would help the club develop in terms of its financial size and the players we can bring in. I'm predicting a toppling of R*d B**l Salzburg either next season or the one after by yourself on a domestic scale. Make it happen Great update btw, nice to see you incorporated the lower division too. I appreciate that update. It's nice to have everything rounded up with a clear understanding of how the league went, as well as who is joining you in the top flight next season. I agree with Jack, next year is the year! I agreed with Jack, RBS are a goner next season! Die Vielchen today discovered the shape of their Bundesliga campaign in the upcoming 2018/2019 season as the fixtures for the initial stage of the tipico Bundesliga were released today by the OFB. Fans of Die Vielchen will no doubt have had their eye on the fixture list for some of the big clashes for Austria Wien, namely big league clashes with the likes of Rapid Wien and Red Bull Salzburg but no doubt Die Vielchen fans will be looking for the fixtures before and after what they hope will be European fixtures with Christopher Steegmann’s team set to play a two legged third qualifying round tie at the beginning of August. Austria Wien will begin their attempts to win a 25th Bundesliga title with a short trip across Wien to face newly promoted Floridsdorfer at the FAC-Platz on Friday 26th July. Floridsdorfer won the Erste Liga by a solitary point last season, and under manager Oliver Oberhammer, will be looking to seal survival in the Bundesliga this season, having made eight signings this summer as they look to bolster their side ahead of a long and arduous Bundesliga campaign. Meanwhile on Matchday 2, Austria Wien will host bitter rivals Rapid in the first Wiener derby of the season in a very early clash between the two giants of Austrian football. The game against Rapid will be played just a few days before Austria Wien begin their bid to qualify for the Group Stages of the UEFA Champions League, adding another spectacle to the tie. Die Vielchen will round out the first month of the season with a visit from Rheindorf Altach after the second leg of their Champions League tie, with fixtures to follow away at St. Polten, at home to Sturm Graz and then away at Wolfsberger. Meanwhile Austria will face a huge fixture against Red Bull Salzburg at the Generali Arena on the 19th October, just a week before the Wiener derby return tie at the Allianz Stadion. 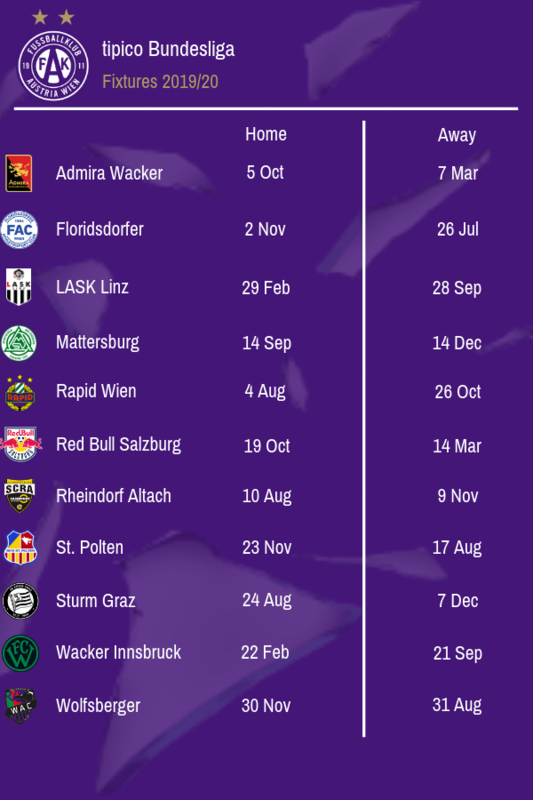 The fixtures are subject to change this season, with TV coverage dictating some fixtures and, as many Austria Wien fans will hope, the inclusion of European fixtures in Austria Wien’s schedule impacting on the availability of the team on certain dates. Jack: Yeah I’m hoping your prediction will come true mate, think we could have done it this year if it wasn’t for that little dip in form. Next season is a new season though and we hopefully will push on! Thanks man, took a long time to do and scroll through the season to formulate the story of the season but worth it in the end! 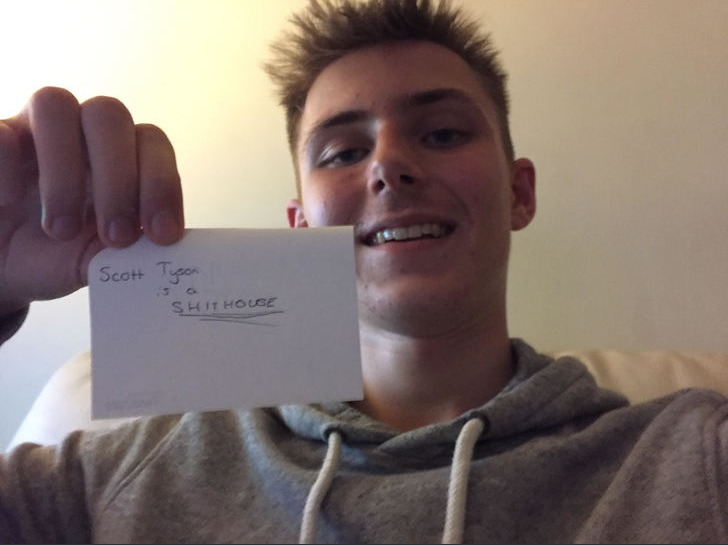 ScottT: Thanks mate glad you liked it! Hopefully next year is the year! Justice: So long Red Bull! Some fixtures will obviously be disrupted by UCL games but looking forward to your derby clash and the game versus RB! Hopefully you can start strongly and build on that. It's always good to get early momentum as the more confidence you have, the more freedom you have. Die Vielchen today announced their third signing of the summer transfer window, by confirming the arrival of 33 year old centre back Hubocan from Ligue 1 side Olympique de Marseille on a free transfer. Hubocan, who has made 65 appearances for the Slovakian national team, is out of contract at the Stade Velodrome on June 30th, and as such manager Christopher Steegmann has seen fit to bring the versatile defender to the Generali Arena as Austria Wien continue their preparations for a hopeful run at the Bundesliga title this season. Hubocan, is a two footed defender, capable and comfortable at playing anywhere across the backline, giving Steegmann an option that he didn’t have available to him last season. The German will be hoping that the experience that Hubocan brings with him, having won the Coupe de France with Marseille and the Russian Premier League with former club Zenit St. Petersburg, will help Die Vielchen immensely as they look to make a better bid at winning the Bundesliga title, having run Salzburg close last year and having missed out by only six points. Jack: That kind of disruption is a very much wanted kind of disruption though! ScottT: Definitely, the fixtures we’ve got are games we will be looking to win and we need a strong start to keep the pace with Salzburg or to build a lead on them because they will be there or there abouts for definite. Justice: Hoping we can really put them to the sword, we’re looking really strong again and hopefully we can brush them aside and give the home fans something to really cheer about come full time! I rate that piece of business massively. Hubocan is an excellent addition to your squad and adds a wealth of quality and experience to the side. His presence will certainly be a boost, as he is more than capable of aiding the abundance of young talent at the club. That is a massive signing. Very experienced, quality defender with a pedigree. He'll be an incredible asset for the coming season! FK Austria Wien have today unveiled Nigerian winger Blessing Eleke as their third signing of the summer as manager Christopher Steegmann continues looking to bolster his side ahead of the new Bundesliga campaign which kicks off in just 25 days. The 23 year old arrives from Swiss side FC Luzern for a fee of around £1.1 million, with the allure of Champions League football being the deciding factor in the former Olimpjia Ljubljana winger. Eleke is believed to have been identified as a key transfer target by Steegmann and his scouting team as far back as January but a deal was left to be completed upon the opening of the summer transfer window. Eleke, is at his best when deployed on the left hand side of an attacking set up, with the Nigerian possessing the ability to cut inside on his right foot, driving into the space left behind the opposition defence, before either shooting or assisting for his team mates. The arrival of the 23 year old will create much needed competition for the position in the Die Vielchen set up with Dominik Prokop featuring most prominently in the role last season, although the young Austrian winger impressed and it is believed will continue to operate as first choice for Christopher Steegmann heading into the upcoming campaign. Having scored four goals in 16 appearances in the Swiss league last season, Eleke arrives for a big fee for a Bundesliga side and will be expected to hit the ground immediately, with a gruelling pre-season ahead of him in the Die Vielchen set up. 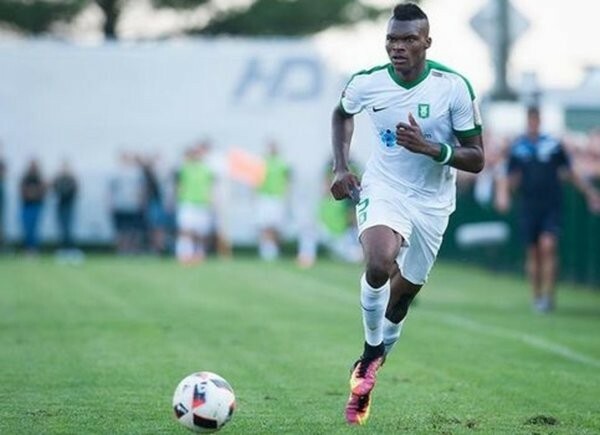 With Austria Wien facing five pre-season friendlies before they open their OFB-Cup campaign away at Altenmarkt, Eleke will be determined to prove himself ready for the first team, especially with Austria then facing Floridsdorfer in their opening Bundesliga fixture less than a week later. ScottT: Picking him up on a free is huge because he is going to add so much to this team! He’s a European football experienced player and that is going to be vital heading into the new campaign. Justice: Great piece of business! ...Oo Justice hasn't commented yet so I can get a pun in first. I'm sure his arrival will be a real BLESSING. I'm so sorry.